The biOrb CUBE Aquarium is a unique, modern looking complete fish tank setup. 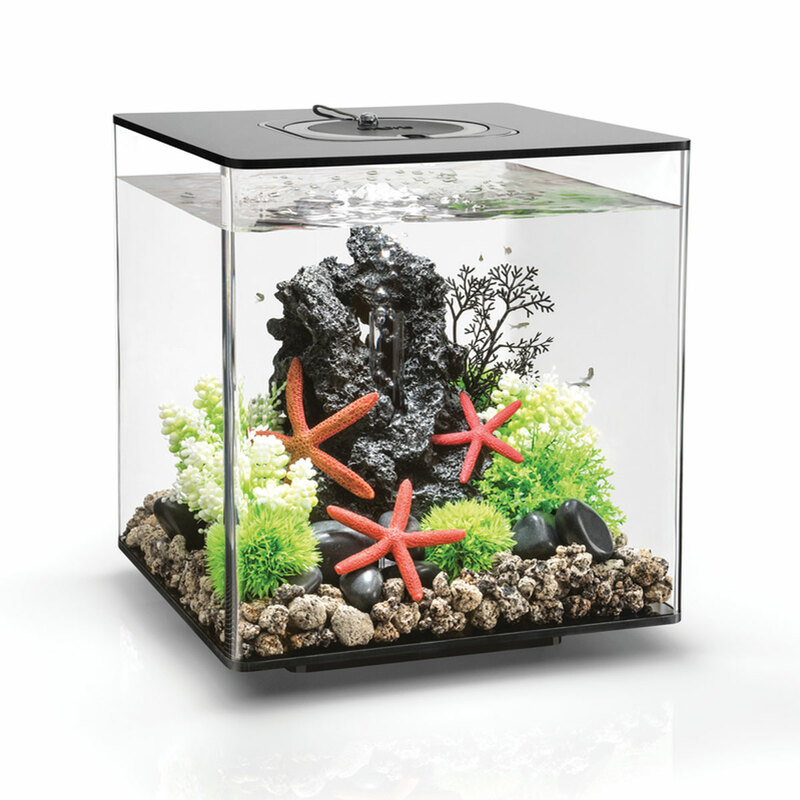 For extra durablitiy and longevity, the biOrb CUBE is made from high quality lightweight resin material, and boasts a seemless edge for maximum viewing pleasure and aquascaping space. The MCR (multi-colour remote) Lighting is the perfect addition to your aquarium, and features 16 pre-set RGB colours which can be changed remotely along with the brightness of the lights aswell. The LED Lighting unit is extremely energy efficient and can last up to 50,000 hours, great for creating an elegant aquatic display in your home. The Air Pump with Air Stone provides your aquarium with plenty of aeration, helping to create an Oxygen rich environment for your beloved fish. To help you get started, included in this aquarium setup is a 2 part water treatment which boosts useful bacteria, aiding in kick starting your aquariums ecosystem to create the perfect environment for your fish. The Filtration Unit uses ceramic media (included) to provide biological filtration for your aquarium, making cleaning and general maintenance a lot easier. Simply replace the cartridge and replace a third of the water in the aquarium every four weeks and you are good to go. A low voltage transformer with 2 din sockets for both the lighting unit and aquarium pump. An in-depth manual which will help you with every part of setting up and maintaining your aquarium. **Please Note** - Decoration is not included, images are for illustration purposes only.